Extreme weather: New research links it to global warming. 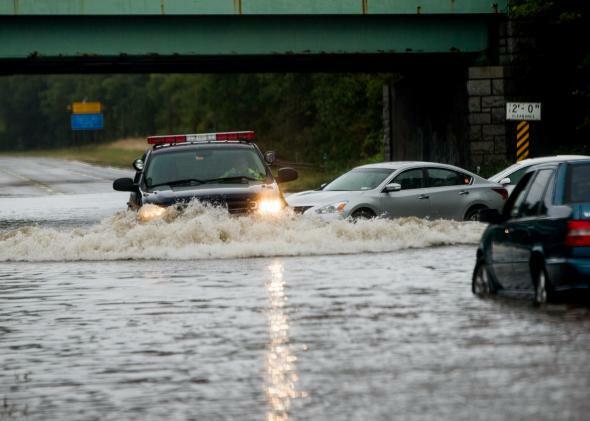 Islip, New York, got slammed with 35+ cm of rain in less than a day on Aug. 13, 2014, causing widespread flooding. New research suggests global warming may be a root cause of extreme weather events like this. If you live in some parts of the Northeast United States,* you just experienced two months’ worth of summer rain falling in less than a single day. Of course, if you do live in the swath of the country from Detroit to New York and down into the mid-Atlantic states, you hardly need me to tell you that. Look out the window. But what you might want to know is that the deluge you’re getting may be due to climate change. Tying extreme weather to climate change is tricky. It’s not so much “this event was due to the Earth warming, which is disrupting the climate” as it is “statistically speaking, we’re seeing more extreme weather events, getting even more extreme over time”. Think of it as playing craps with ever-so-slightly loaded dice. You can’t be sure that snake eyes you threw was due to the dice being weighted, but over time you’ll see a lot more of them than you’d expect, statistically, from fair dice. We’re throwing an awful lot of meteorological snake eyes lately. A paper just came out by a team of climatologists possibly linking global warming to these extreme weather events. It’s based on an idea that’s been around a while, but hadn’t been verified. Now we’re seeing evidence for it. The key to this is what’s called a “blocking pattern”, where a high-pressure system becomes immobile, squatting over a specific spot. Under the high-pressure spot, this can bring long, grueling heat waves that don’t go away for days or weeks. On the edges it can bring a deluge of rain, as moist air from the south is brought up to meet colder air coming down from the north. That’s what Detroit and New York just went through. These blocking patterns are themselves associated with the jet stream, the constant flow of air about 10 kilometers above sea level at latitudes between 30° and 60°. Sometimes the flow weakens, and the winds can dip down into more southern latitudes. These meanders (sometimes mistakenly called the “polar vortex”) depend on a lot of factors, but the new research just published indicates they may be due to the Arctic warming up. The physics is complicated — fluid dynamics is amazingly subtle and complex — but the research indicates a warming Arctic can create and amplify the conditions that lead to jet stream excursions, and therefore blocking patterns. 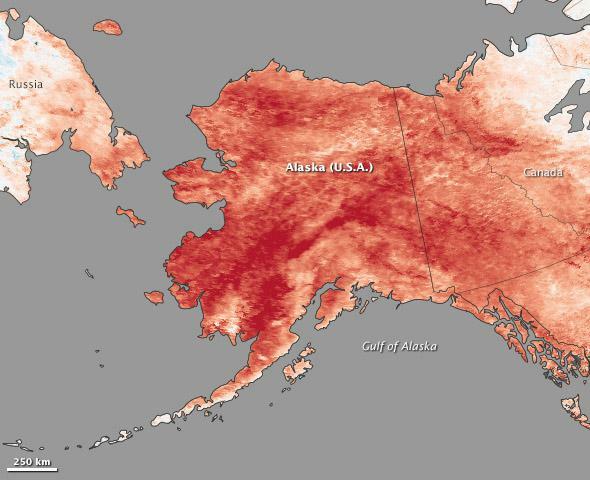 In 2013, a blocking pattern squatted over Alaska, causing record breaking heat for the largest state. Photo by Jesse Allen and Jeff Schmatltz, using data from theLand Processes Distributed Active Archive Center(LPDAAC) and theLANCE/EOSDIS Rapid Response. During the Alaska heat wave, I mentioned that there were some scientists wondering if this were tied to global warming and climate change (similar thoughts happened after the Boulder flood as well), and of course the usual suspects came in and raised the zombies of denial. This new paper supports what I was saying. Again, we can’t always point to any one event and say “global warming caused (or amplified) this — though sometimes we can. But as our planet heats up, as ice in the Arctic, Antarctic, and Greenland slides away, as California continues to suffer its most apocalyptic drought on record, pointing a finger at such things will get easier and easier. Tip o’ the brolly to The Guardian. *Correction, Aug. 14, 2014 at 14:15 UTC: I originally wrote the Northeast U.S., but of course only some parts got the torrential rain, like Islip, New York. I apologize for using imprecise language there.